It may have been a cold outside over the weekend, but inside there was a party heating up for my friends’ Sadie and Trevor. On a crisp January afternoon, these two lovely people became man and wife! Its still so crazy to say it out loud. The wedding was beautifully decorated, and I’ll get to more on that further down in the post, but first I want to share some photos from the ceremony. 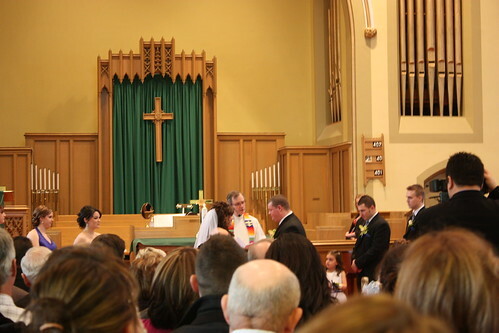 The ceremony was held at a big church, with a packed crowd, eager to see these two lovebirds tie the knot. 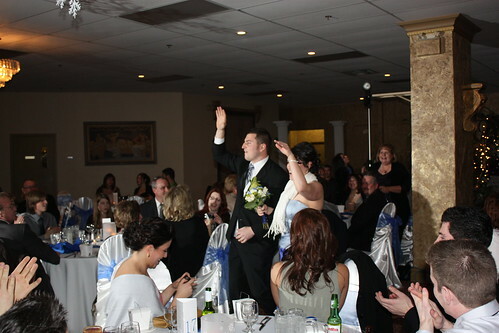 When the bride arrived everyone was beaming. She looked so pretty and incredibly happy. 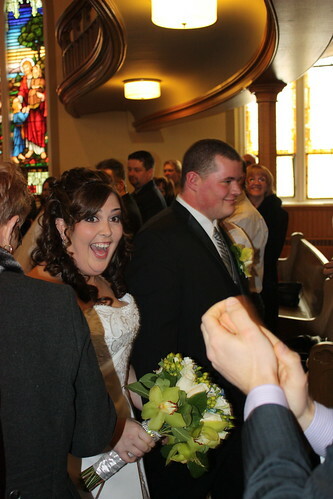 I love this photo, because this is the exact moment that she saw all of us in the pews. It captures all the happiness that just seemed to be bubbling over her. 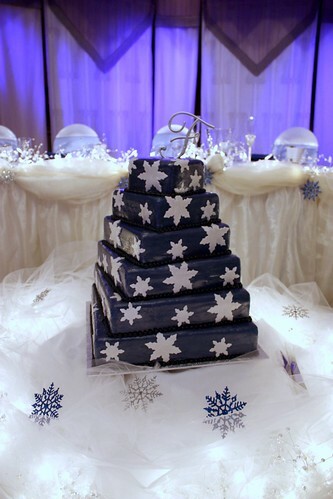 The reception was held at a nearby banquet hall, gorgeously decorated in lovely blues and white, with delicate snowflakes everywhere. 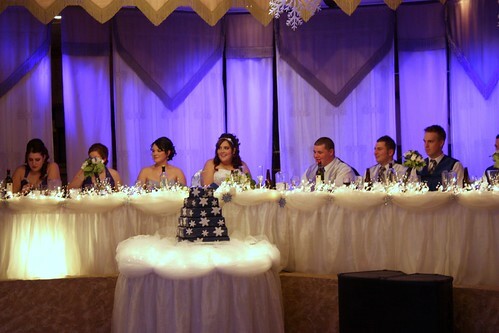 The head table was gorgeous with fluffy tulle with little lights under it, looking like freshly fallen snow. 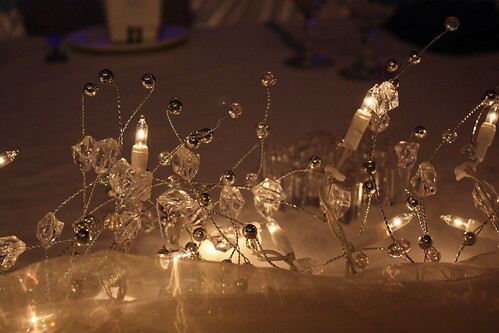 From afar, this crystal garland and lights looked incredibly enchanting in amongst the tulle “snow”. 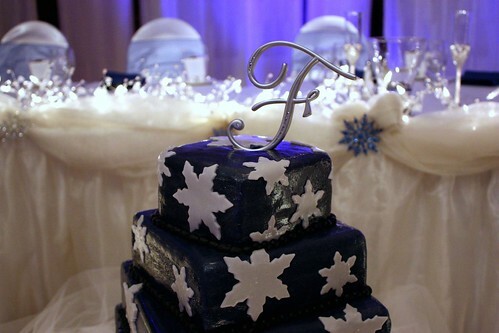 The cake was done by the groom’s extremely talented cousin, Sam. 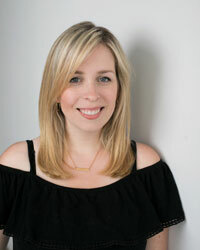 This lovely lady is the same mastermind behind Amy’s gorgeous birthday cake. 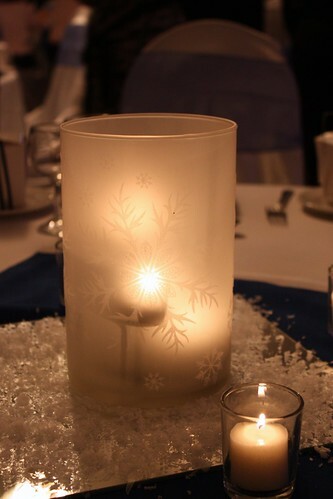 The centerpieces at each table were large frosted hurricanes with snowflake designs, with smaller tealights nestled in among the fake snow. 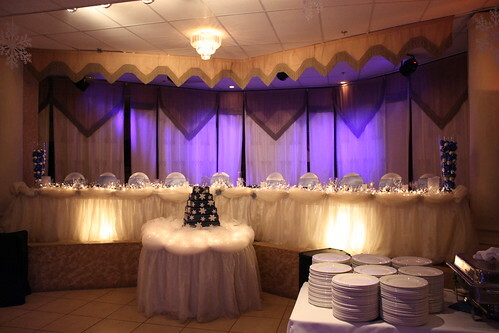 Seeing the whole room lit by candles really added to the romantic feel of the night. 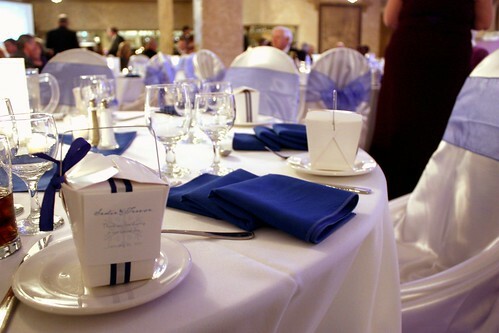 At each place setting there was a take out boxes, decorated with navy and silver ribbons. 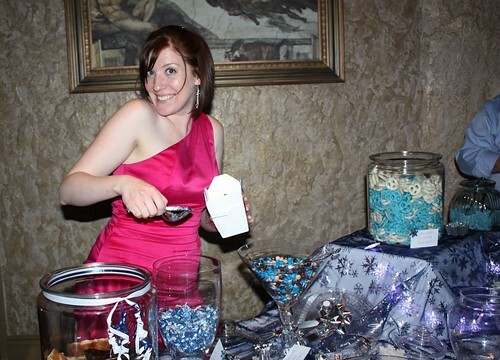 Guests were encouraged to go to a candy bar to fill up on goodies. Sadie was incredibly sweet and filled mine up with plenty of peanut-free goodies, including these Cookies-n-Cream Hershey Kisses. These are so unbelievably good. I was addicted by the end of the night. 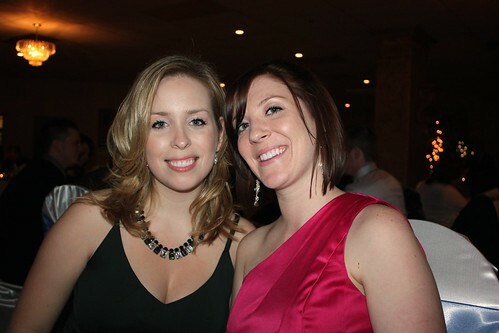 I went as my friend Amy’s date for the evening and we had a blast talking and dancing the whole night. 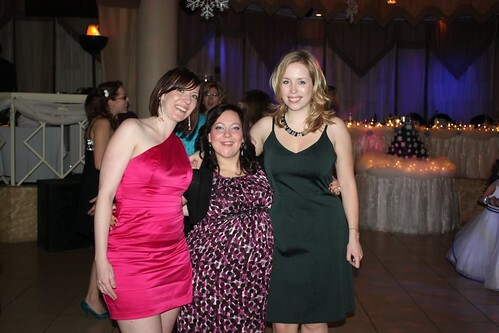 The great thing about weddings, is that you get to catch up with friends that you don’t get to see very often. 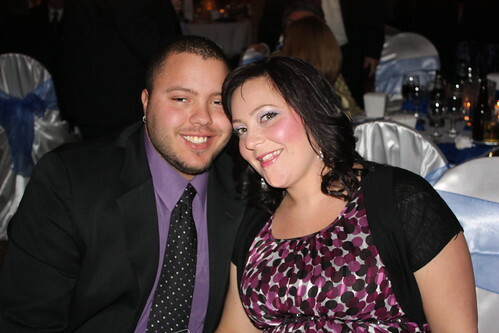 My good friend Ashley and her husband Adam made it to the wedding too. This little lady is a powerhouse. She is eight months pregnant, but she still managed to get up super early that morning, do all the wedding party’s hair beautifully and make it through the evening. I hope that she went home and got to bed early that night because she sure deserved the rest! I still can’t believe that in only a short six weeks we’ll be adding her little bundle of joy to the gang. I can’t wait to meet him! Before we knew it, cocktail hour was up and the wedding party arrived. Dressed in beautiful scarves, they made their grand entrance. 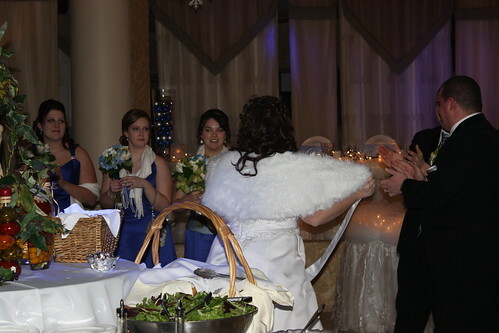 Sadie had on a beautiful white faux fur shawl with a big satin bow in the front. A great way to look fabulous and warm on a cold winter night! 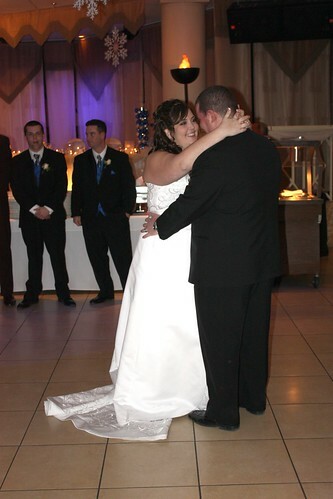 They had a beautiful first dance that got everyone a little misty. 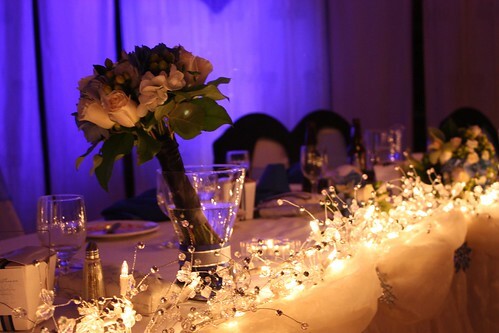 The wedding party enjoyed their dinner up at the head table, where everyone could see the glowing couple. 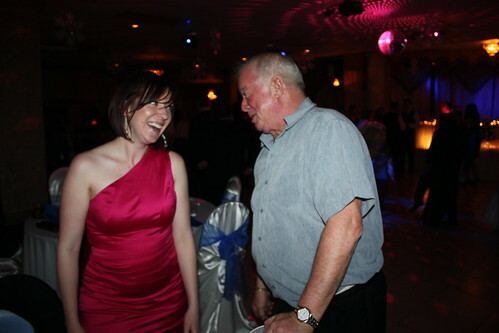 At the beginning of the speeches, the groom father warned all the ladies in the room that his cousin was a bit of a handful and that we should watch out. Sure enough he made a beeline for Amy. But in true Amy fashion, she had a comeback for everything that he said. 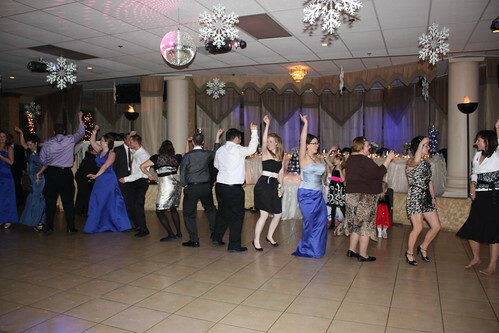 As soon as the food was served, it didn’t take long for everyone to be on the dance floor. It doesn’t seem to be a wedding unless some of the classic dancing songs are played, including Sir Mix-A-Lot’s “Jump On It”. Gotta love a throwback to Will Smith’s days on The Fresh Prince of Bel-Air. 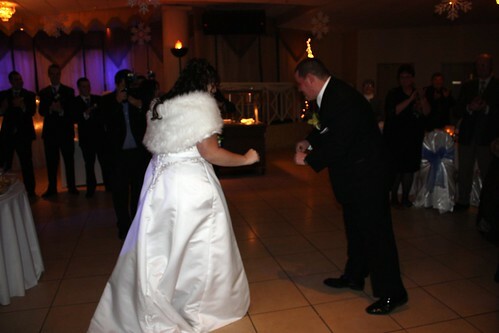 Every chance we got we were out on the dance floor, celebrating with the happy couple. 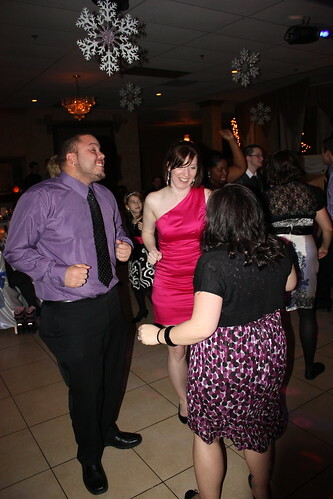 This photo really cracks me up, and it sums up how Amy and I just totally get into our dance moves. 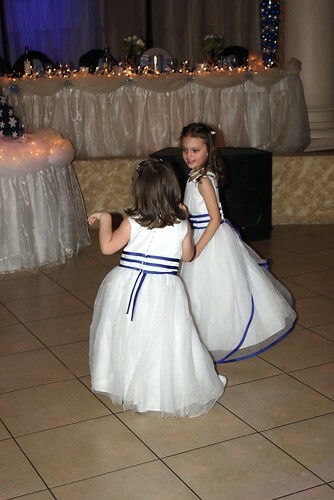 The little flower girls loved spending the whole night twirling their full dresses around and around. 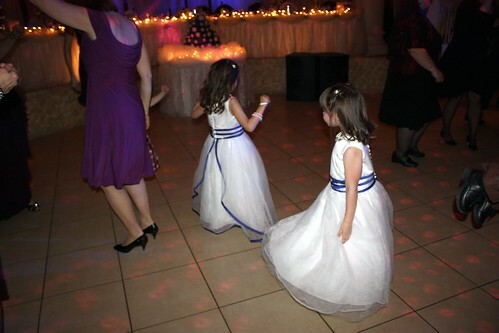 They must have felt like little princesses. So cute. What can I say? 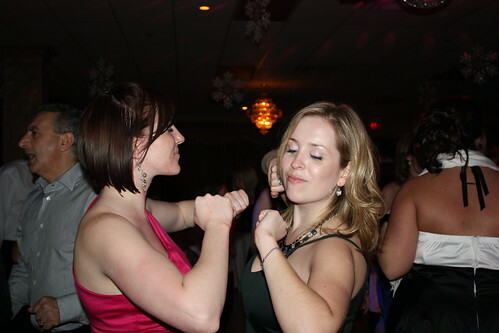 We like to dance…alot. 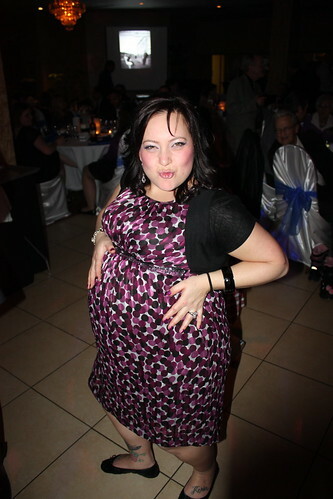 You have to admit, this is one hot mama! 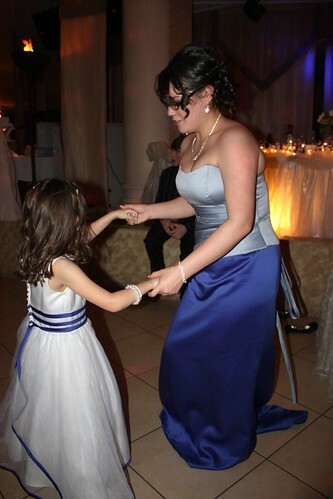 I swear that the kid is going to come out dancing already. 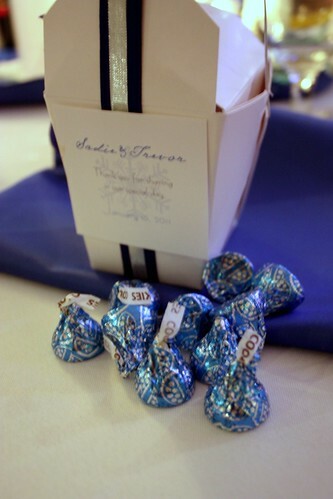 As the night started to come to an end, everyone started filling their little takeout boxes with delicious candy goodies. Here is Amy demonstrating an excellent pour of Almond Joy bites. 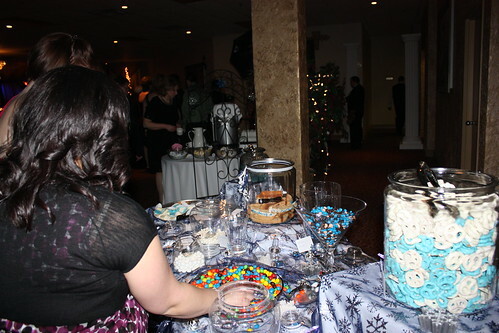 I loved how most of the candy was in the theme of the colours, including homemade biscotti and chocolates. 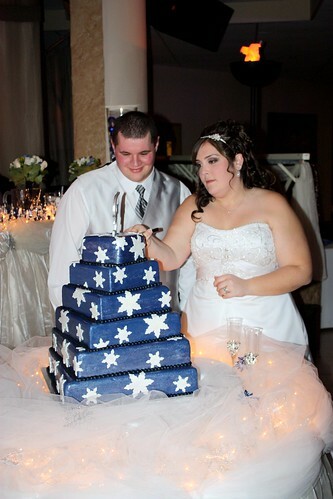 It was time to cut the cake, and everyone gathered to cheer them on. Thankfully there was no cake smushing going on here, just nice bites. 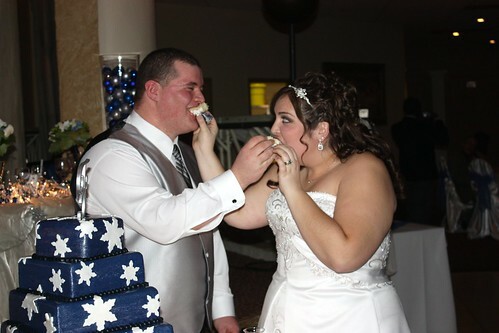 I never really got the whole smashing cake in each other’s face thing. 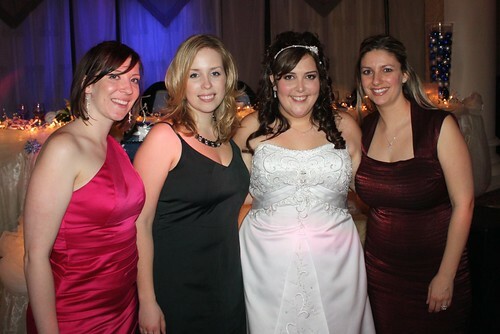 The ladies with the beautiful bride. I’m so happy for her and how wonderful her wedding day was. 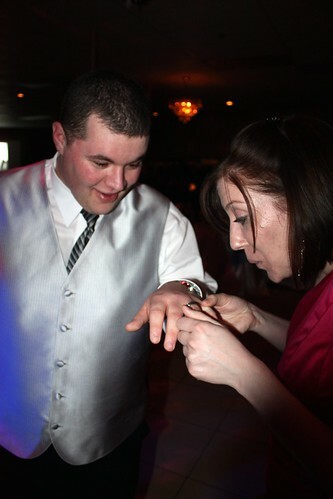 Of course we had to show the handsome groom some attention too and admire his new ring. 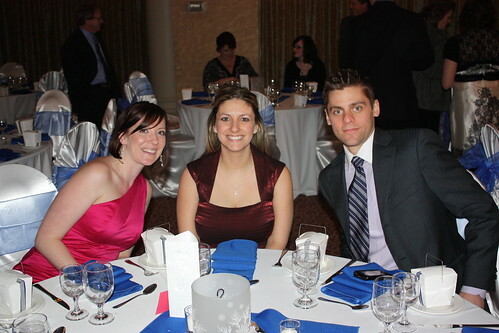 It was a great evening spent with wonderful friends, celebrating the love of two amazing people. It may have been cold outside, but there was plenty of warm love inside. 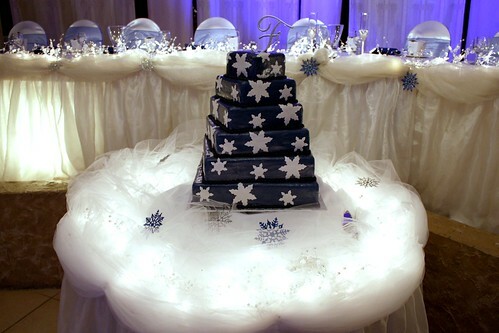 Who knew that a winter wedding could be so great! 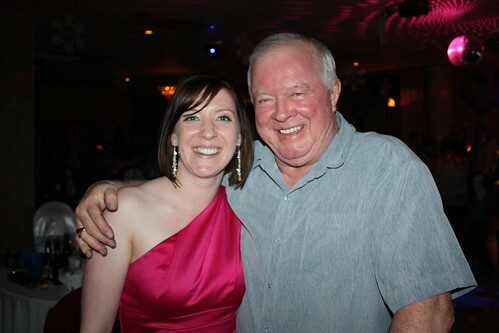 For family and friends, if you’d like to see more pictures from the wedding, click here.